This is an incredibly useful and inspiring book that I’ll be reading again and referring back to frequently. Originally published in Germany, it sold over 100,000 copies within just 9 months! This is testament to the fact that is meticulously well written and researched. 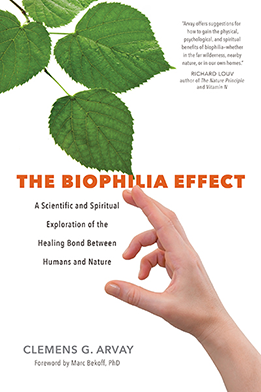 The Biophilia Effect is an insightful guide into how Nature can heal us by supporting our immune system, reducing stress levels and lowering blood pressure. The book delves deeply into scientific research and case studies that demonstrate how Nature affects us psychologically and physically. We can all appreciate the power Nature has to heal us; it’s something we feel intuitively. Having this explained properly and in depth from a scientific perspective is so refreshingly helpful though, as it brings greater precision to our understanding. Clemens G Arvay writes with great sensitivity throughout. He seamlessly blends spiritual practice with scientific knowledge, guiding us on how to deepen our connection with the land and our ancestral roots. Well researched explanations, coupled with guides on how to create a group wilderness retreat or an anti-cancer garden, produce a book that is useful to so many people on so many levels. Stories in the book are full of truth and meaning and help to highlight the guidance in the chapters that they accompany. Whether you are a shamanic practitioner or an avid gardener, you’ll love this book….it’s a MUST read!! Review Details: The Biophilia Effect was reviewed by Joe Caudwell and the review was published in Issue 38 of Indie Shaman.